The Senate on Tuesday said President Muhammadu Buhari has not violated any law by not returning from medical vacation after 90 days. It cautioned the sponsors and participants in the protests by a coalition of civil society organizations, operating under the aegis of #OurMumuDonDo, and demanding for the resignation of President Muhammadu Buhari over his medical vacation in the United Kingdom to stop heating up the polity with their unreasonable demands. 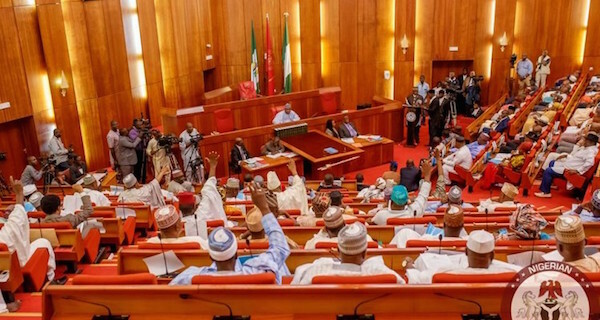 In a statement signed by its spokesman, Dr. Aliyu Sabi Abdullahi, the Senate said the protesters were only creating unnecessary tension in the country and seeking to divert the attention of the Presidency from the economic and security issues which are being tackled with vigour. The Senate noted that President Buhari had complied with the provisions of the 1999 Constitution, which stipulated that he must handover to the Vice President and duly inform the two chambers of the legislature about his medical vacation. “The President has broken no law and therefore we do not see any justification for this diversion and noise making. The sponsors are merely seeking cheap publicity at the expense of the peace of Nigeria. We, in the National Assembly, are satisfied that there is no vacuum. The Federal Government is working. Acting President Yemi Osinbajo is providing the required leadership. So, there is no reason for the protests. “All Nigerians now should focus on praying for the safe return of the President. We in the Senate are happy about the report by the Governors and party leaders who recently visited President Buhari in London and we know he will soon return to continue to provide leadership to our people and the rest of Africa. “We therefore call on the protesters to stop all these demonstrations and let their sense of patriotism overshadow the zeal for activism by joining other Nigerians to pray for the President, the acting President and Nigeria as a country at this critical period”, Abdullahi stated.